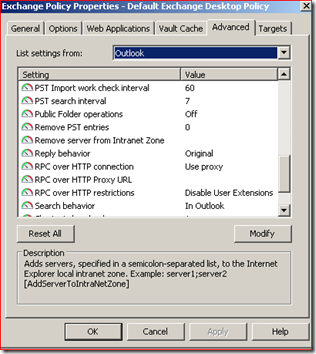 The “issue” is the setting “RPC over HTTP restrictions” and the fact that the default behaviour, when this is in use, is to disable the whole of the Outlook Add-in entirely. Not good for an end-user! The question is .. How does the Addin “know” that RPC/HTTP is enabled? The answer is that it doesn’t. There isn’t an Outlook Object Model or Outlook API (that we know of!) that can tell us HOW Outlook is currently connected. 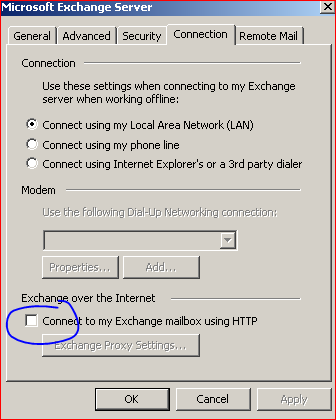 We can find out whether the connection is online, cached, disconnected, working offline, in drizzle mode and so on, but not whether the connection is RPC or HTTP. 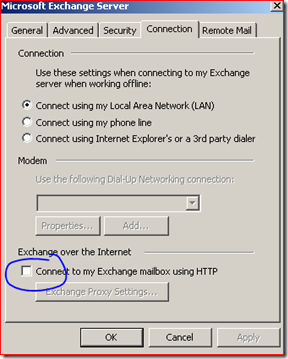 If that check box is ticked, we assume that RPC/HTTP (or Outlook Anywhere) is in use, and take the action defined by the policy. It’s not ideal, but it’s the only way we can do it. Since Enterprise Vault 8 Service Pack 2 a warning is shown when Outlook opens indicating that the EV Administrator has disabled the extensions – the idea being that the Administrator will see this first, and go and check/change the policy as required.